As teachers, coaches, advisors, club leaders, theater directors, and dorm parents, we welcome the opportunity to get to know you and your son or daughter and promise that we will get to know them well inside and outside of the classroom. Together we will discover their strengths and weaknesses and we will work to challenge them where they are capable, and support them where they need guidance. In a constantly changing world where we are uncertain what the future holds for our students, we are committed to challenging our students to work hard academically, and also to practice the skills they will need for success in college and beyond. 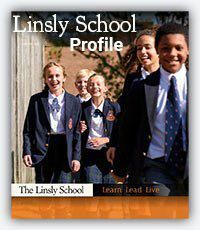 Get involved in a number of opportunities here at Linsly from proposing a new club to being the captain of your team to tutoring another student in a subject that is a strength for you. Prefect system - Linsly’s form of student government. Committee Chairs work with Jr. & Sr. prefects on a number of goals. Rigorous college preparatory program that will challenge students and push them to work at the highest level they are capable of. The classroom environment allows both teachers and students to challenge each other to perform their best. All of our teachers are available individual support and one on one instruction before school, and most have office hours available before school and after school as well. Aviator: Students are enrolled in this program based on teacher recommendations and it is available to students during the academic day. This would be applied to their daily schedule in place of a study hall. The mission of the Aviator program is to provide students with an opportunity to receive individualized instruction in a safe and distraction-free environment that will allow for optimal student performance and dynamic growth. TALC: Transition to American Language and culture if a course that provides support to English as a Second Language students through an authentic, individualized approach to learning English language skill and cultural knowledge to promote and support optimum performance in all core academic areas. Upper school International students in grades 8-12 will receive additional academic support in a collaborative group setting and individualized basis in areas of reading, writing, listening, speaking, and basic grammar as they pertain to their core class work. After Hours Learning Center: Available Monday to Thursday to boarding students is a more structured and supervised study environment. Boarding students are able to study in their room, but those needing additional support including organization and supervision will go to the library during study hall hours.